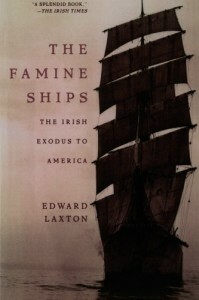 A helpful little book, if not especially exhaustive for use as reference material to those interested in the conditions aboard the ships ferrying immigrants during the Great Famine. It clocks in at only 250 pages, which is great for anyone in a basic run-through of the different kinds of ships involved in the exodus, the ports between which they travelled, and the practices of both the companies that owned them and the governments that oversaw them. Laxton, himself an Irishman, approaches the subject with a mildly self-righteous tone, which is understandable, but occasionally makes the book more preachy and melodramatic than informative.